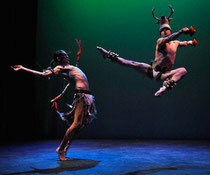 DANCING EARTH - ARTE AMAZONIA provides a global voice through art for the indigenous cultures of the Amazon. DANCING EARTH spins, stomps and spirals into life on the world’s dancing grounds as a collective of intertribal Indigenous dance artists, under the leadership of internationally respected choreographer Rulan Tangen. Rooted in the spirit and energy of the first peoples and the land, the mythic power of DANCING EARTH ‘s creations respect, embrace and expand the context of Indigenous culture into vital contemporary relevance. blood memory in motion - that speaks to all beings. We believe in dance as an expression that can illuminate issues of cultural, historical, philosophical, mythic, and spiritual relevance. The Director, Rulan Tangen, is a Native American activist, teacher, and most importantly, she is the principle dancer and choreographer for, Dancing Earth. This incredible group of dancers is made up of indigenous people who perform to audiences around the world. In addition, it is interesting to note that Amazonia Artist, Barrett Martin has played drums with them a few times and says that, " it is always inspiring to play for such beautiful and powerful dancers." To learn more about their project and to help support travel expenses and scholarships for young dancers, please go to their website and support these talented people from the First Nations.